What’s the playable file format for Apple TV? If you're looking to buy a media-streaming box, it's likely you'll end up choosing between three types: Chromecast, Roku and Apple TV. Obviously Apple TV is the most popular and widely used not only because of its Apple Logo, also its outstanding performance. Apple TV is an excellent iOS companion. If you own a lot of music, movies or TV shows on iTunes, the Apple TV enables you to access all that content on your TV and connected sound system. And if you use iTunes Match, all your cloud-stored music is available as well. Therefore you could watch movies, and listen to music all around the house via home network. While the limitation of video and audio formats of ATV does not allow you to watch Blu-ray and DVD movies as well as videos like MKV, AVI, FLV, WMV on Apple TV since they are not Apple TV accepted video files. 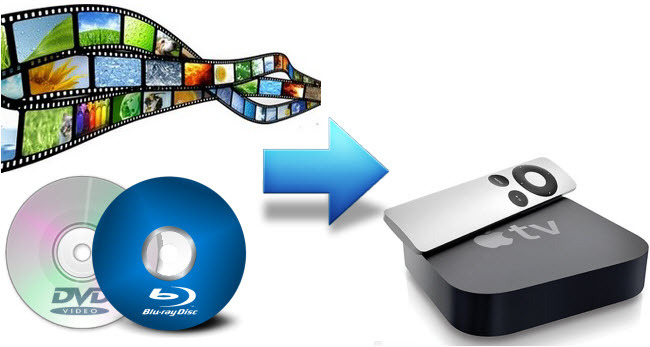 How to enable Blu-ray, DVD and unsupported video files in Apple TV for viewing? 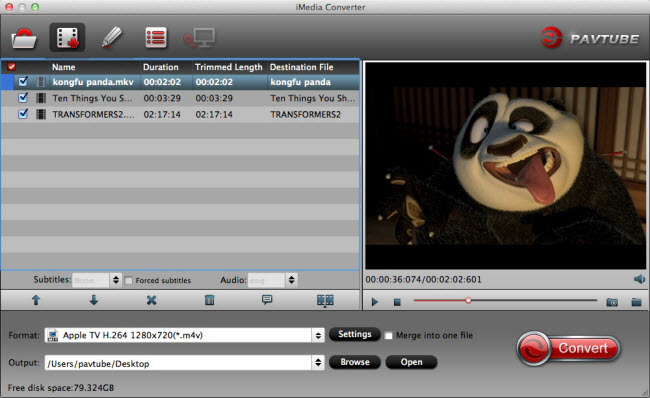 In order to convert Blu-ray, DVD and MKV/FLV/WMV/AVI video to Apple supported video format on Mac OS X, you need Pavtube iMedia Converter for Mac. With it, you can easily rip any incompatible file (2D/3D Blu-ray, DVD, video and movies) to M4V, MP4, and MOV added into iTunes and then stream to Apple TV for watching anytime and anywhere. Step 1: Add Blu-ray, DVD or video file. 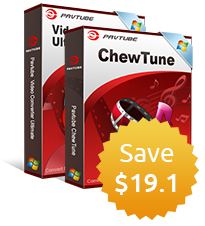 Install Pavtube iMedia Converter for Mac and launch it. Insert Blu-ray or DVD into disc drive and load into this app by clicking "Load file(s)" button. For video files, you could add a single video or a folder or full of video files by "Add video" icon. Tip 1: After successful import of Blu-ray and DVD, don't forget to select one subtitle and audio track for output. Step 2: Choose optimized video format for Apple TV. Pavtube offers you lots of choices for output. In order to get Apple TV playable video format, you are suggested to choose from Apple TV category under Format menu. Suitable profile can be found here for Apple TV, Apple TV 2, or Apple TV 3. 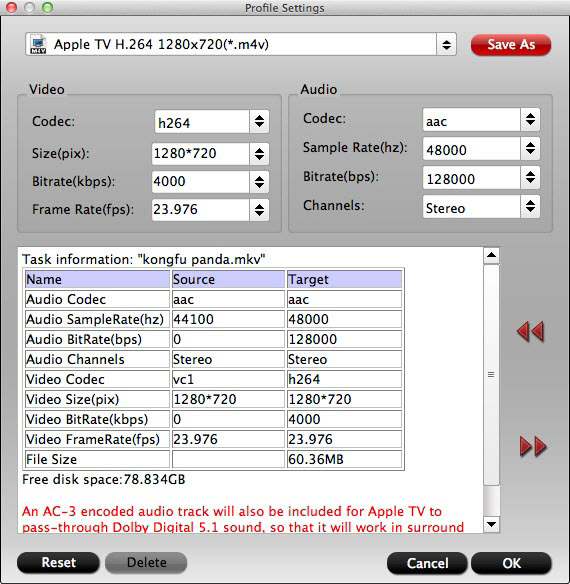 And check this guide if you found no 5.1 surround sound from Apple TV. Step 3: Set profile presets. If necessary, you are allowed to adjust profile parameters in Settings. Presets like video size, bitrate, frame rate, audio sample rate, channels can be customized to achieve a better video enjoyment on Apple TV. Tip 2: Both AAC and AC3 5.1 audios would be saved in output Apple TV M4V video so you could enjoy videos in iTunes and Apple TV without trouble. Step 4: Convert Blu-ray/DVD/video to Apple TV. 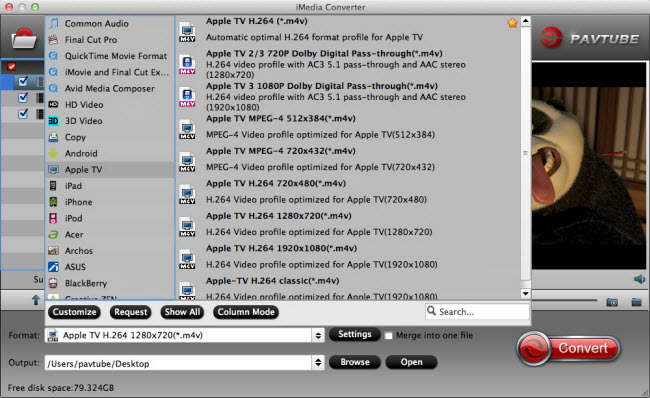 Double check your settings and hit on the "Convert" button to start converting Blu-ray, DVD or video to Apple TV M4V. When the conversion is done, open output folder and you will find the created M4V video. Now you can watch Blu-ray, DVD and video to Smart TV at home from Apple TV. First of all, make sure the computer you want to sync from is on, and iTunes is open. Go to iTunes - Preferences, choose Apple TV, and make sure "Look for Apple TVs" is selected. On your Apple TV, choose Settings - Computers - "Connect to iTunes," and note the passcode displayed. In iTunes, select the Apple TV (below Devices), and enter the passcode. Click the Summary button and select either Automatic Sync or Custom Sync.